Work that has been engaging with mobilities research in the Humanities includes a new book by Professor Cathy Coleborne, Insanity, Identity and Empire. Her book engages with issues of the mobility of people across the British Empire to Australia and New Zealand in the second half of the nineteenth century. We invited Cathy to present her latest work. Although mobility ‘as migration’ is critiqued by historian Tony Ballantyne (History Australia, 11: 2, 2014), who points out that mobility is more productive as a concept when historians consider its other applications, such as the circulation of ideas and practices, the way that immigration histories might be reinterpreted inside a mobilities paradigm is clearly important. My new book Insanity, Identity and Empire (Manchester University Press, 2015) looks at the flow of medical ideas and practices across institutions, as well as the movement of peoples both into and between social institutions, both of which were factors that contributed to the formation of colonial social identities inside the institutions for the insane in Australia and New Zealand. The book reminds us of the varied journeys of immigrants to the colonies: and of how and where they stopped, immobilised for different reasons inside the social institutions of the period. By locating this study inside a mobilities framework, I suggest that historians are yet to fully understand the meanings of mobility in the colonial world. This is despite the fact that historians have productively engaged with the structural imperatives of ‘Empire’ and with the varied imperial meanings of gender, sexuality and medicine, and considered the movements of travellers, migrants, military bodies and medical personnel, as well as ‘transnational lives’. As the colonies became destinations for the many thousands of immigrants on the move, different forms of mobility were desired, including migration itself, or loathed, such as the itinerant lifestyles of vagrants. My recent article in Transfers takes these arguments about the uses of mobility further, showing that the interpretive framework of ‘mobility’ can usefully be extended by suggesting that social institutions reveal glimpses of (im)mobility. As the colonies became destinations for the many thousands of immigrants on the move, different forms of mobility were desired, including migration itself, or loathed, such as the itinerant lifestyles of vagrants. 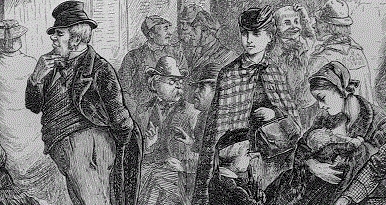 Specifically, the article examines mobility through brief accounts of the curtailed lives of the poor white immigrants of the period, suggesting that mobility was also produced by immigrants’ insanity, vagrancy, wandering, and their casual movement between, and reliance on, welfare and medical institutions. I argue that the regulation of these forms of mobility tells us more about the contemporary paradox of the co-constitution of mobility and stasis, as well as providing a more fluid understanding of mobility as a set of transfers between places and people. In other work, I examine the laws of empire and vagrancy as mobility in my chapter, ‘Law’s mobility: vagrancy and imperial legality in the trans-Tasman colonial world’, in Katie Pickles and Catharine Coleborne (eds), New Zealand’s Empire (Manchester University Press, 2016), pp. 89-101. This work is part of a larger project to examine the registers of mobility in the colonial world though a study of vagrancy laws, practices, stories, prosecutions and patterns of movement by itinerant men and women. Assisting my former colleagues at the University of Waikato, Dr Gail Adams-Hutcheson and Associate Professor Holly Thorpe, I am aiming to co-edit a special section of Transfers, ‘Mobility in a Dangerous World’, which will bring cross-disciplinary perspectives to historical mobility from a range of social science scholars. Currently based at the University of Newcastle (NSW Australia) Cathy welcomes discussion and feedback for her ideas at catharine.coleborne@newcastle.edu.au. She also tweets at @CathyColeborne.